There are many things that are awesome about Stanford. One of these many awesome-tastic features is the fact that we get an entire week off for Thanksgiving. At Caltech, we only got Thursday and Friday off, and most professors considered it a normal week of school when scheduling work for the week. We decided to take advantage of this awesome opportunity to head to Indian Creek for a week of excellent desert splitters. Sarah Kate and I set off from Palo Alto around 2pm. After getting stuck in some traffic and losing over 2 hours because of a little snow over Donner Pass, we made it to Winnemucca, NV at around 11pm and passed out in a Motel 6. Meanwhile, Luke, Konstantin, and Lindsey had left San Diego around 6pm and were driving through the night so they could get some climbing in on Saturday. Sarah Kate and I rolled out of bed at 5:45am and were on I-80 heading east by 5:55am. It was good that the speed limit was 75mph, because we had a lot of distance to cover to make it to the Creek by dinner time. Meanwhile, the San Diego crew was just rolling in to Moab when we were leaving Winnemucca. Even if Sarah Kate and I had driven through the night, we would not have been in Moab yet. We were glad we stopped to sleep. 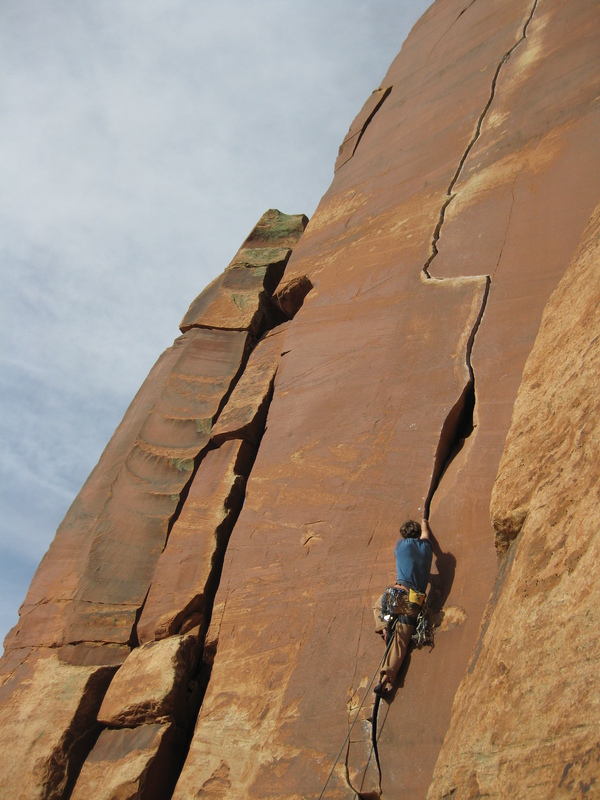 Luke, Konstantin, and Lindsey drove out to the Creek, set up camp, and headed to the Cat Wall to get some pitches in. Luke sent Johnny Cat (5.11+), one of his former projects, as a warm-up. They also got on Mad Dog (5.11+) and Pitbull Terror (5.11). Luke took a (rare) lead fall on gear when a foothold broke unexpectedly on Pitbull Terror. After a rushed water fill-up/gas fill-up/grocery trip in town, Sarah Kate and I managed to make it out to the Creek Pasture by about 7pm to find a crackling fire and three hungry climbers. We had excellent beer sausages for dinner. Sarah Kate and I were again happy that we had stopped to sleep on our drive out based on how tired the crazy drive-through-the-night folks were already. We got on Lady Pillar (5.10-) and Long Island Iced Tea (5.10+) for warm-ups. Sarah Kate, Luke, and I headed over to Soulfire, while Konstantin racked up for Annunaki (5.12-). Sarah Kate onsighted Soulfire, a great start for her Indian Creek trip! Then I got my revenge redpoint, feeling relaxed and unpumped the whole time, which really helped my confidence for the trip. Lindsey also onsighted the route (she hadn’t watched either of us climb it). Meanwhile, Konstantin took some falls on Annunaki, but made it to the anchor. After watching me on Soulfire, Luke headed back over for a flash attempt, which was successful, for Luke’s hardest Indian Creek flash! 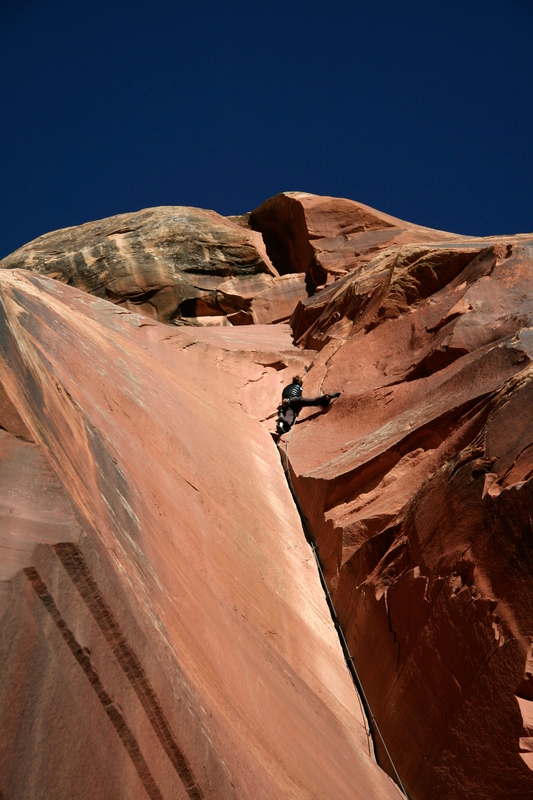 Luke and I walked over to the base of Optimator (5.13-) and found two dudes toproping it, which was pretty awesome. Optimator is definitely a route I’d like to get on eventually, although I know I’m nowhere near ready for it yet (long very tight hands and stacks). It was cool to watch someone on it, though. After our warm-up day(s), it was time to go to Battle of the Bulge to get on some projects. We headed over to The Warmup (5.9 sandbag) to warm up. Luke, Sarah Kate, and Lindsey all sent Our Piece of the Real Estate (5.11-), but I needed to conserve energy. 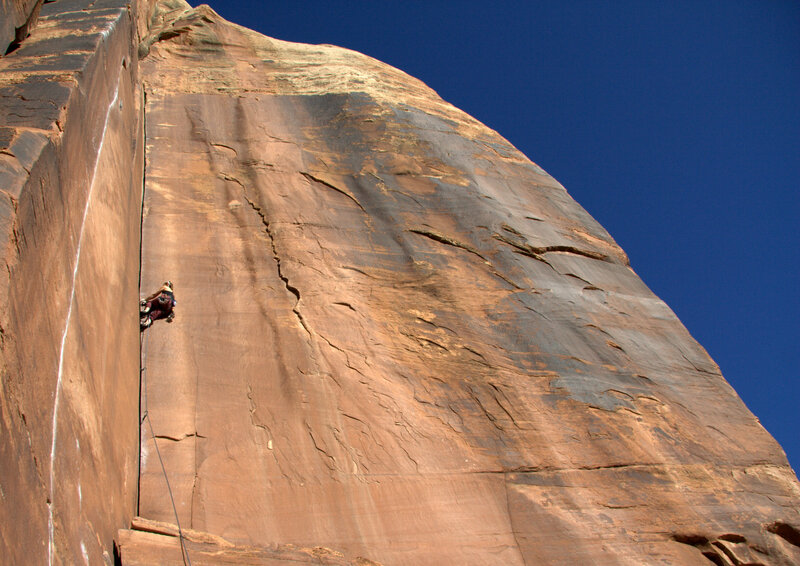 I racked up with the small cams and headed over to Digital Readout (5.12) with Luke. I had been on this route once before, on our first trip to the Creek, and had struggled a lot. I surprised myself and made it to about 3 feet below the anchor, where the footholds disappeared. I tried to figure out a sequence, but my feet slipped and I was off. After a short rest and the discovery of a very small face foothold, I got back on and easily reached the anchor. I was frustrated and exhausted when I got back to the ground, but in retrospect, it was pretty awesome to be so close to sending a 5.12 on only my 2nd try… I tend to be kind of hard on myself. 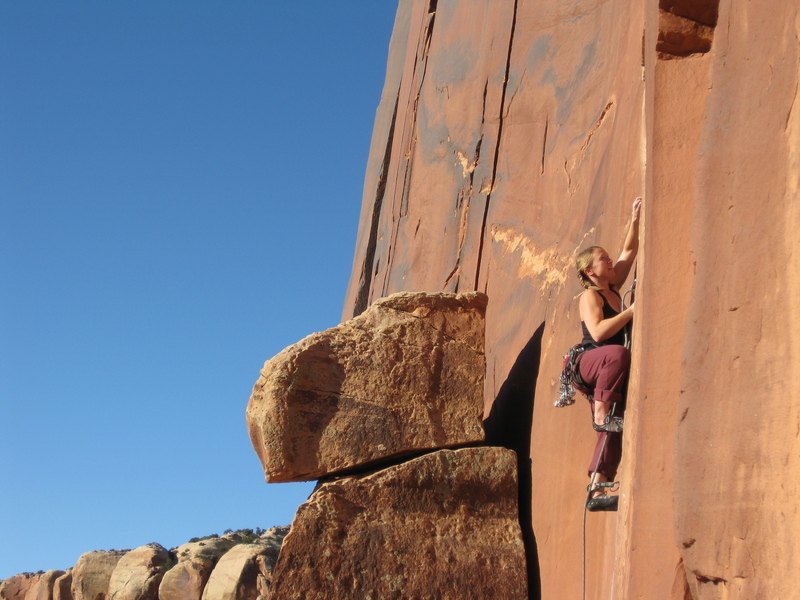 Meanwhile, Lindsey tried The Jane Fonda Total Body Workout (5.11-, probably sandbag), managing to work out the chimney with some takes and figuring out the gear and size beta for the long upper crack. 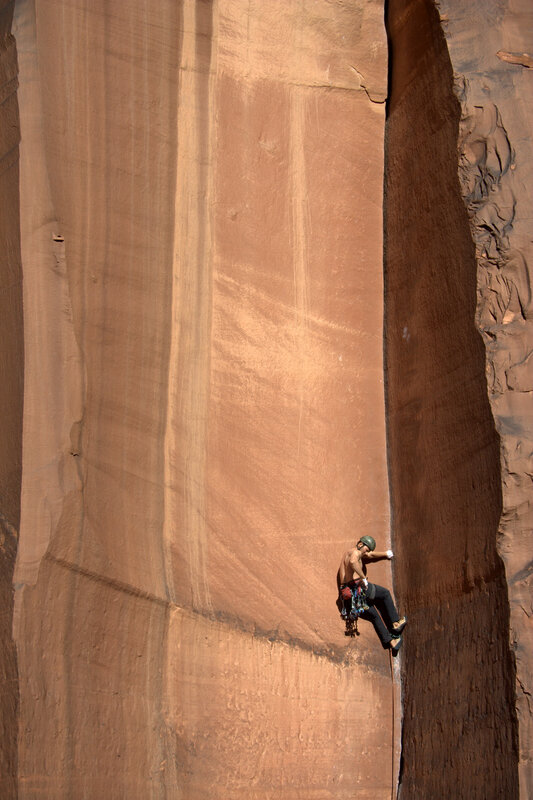 Konstantin took a TR lap on Big Baby (5.11), which Sarah Kate’s friend Dave had put up. Luke and I took a break to watch Andre and Leah working on Ruby’s Cafe (5.13-). After I’d finally recovered from Digital Readout, I wasn’t very psyched on getting back on it, so I decided to try to onsight Quarter of a Man (5.11++). I knew it was a long, sustained route (35m+), so I hadn’t tried it on previous trips because I’d known I didn’t have the endurance. But, I was feeling strong this time, so I went for it. The crack was smaller than I’d expected – mostly sustained black Metolius cams (all the red Camalots were very tight) and there were not many rests. I focused on moving forward and not wasting energy. I had expected the top section, where the crack zigzags steeply, to be the crux, but luckily it was not – there were stem stances and layback jugs, which were great after the long sustained corner. In no time I was clipping the anchor – tying with Sunshine Dihedral (5.11d) for my hardest onsight! Lizzy on the final section of Quarter of a Man (5.11++). I gave Luke the beta and he set off on his flash go. 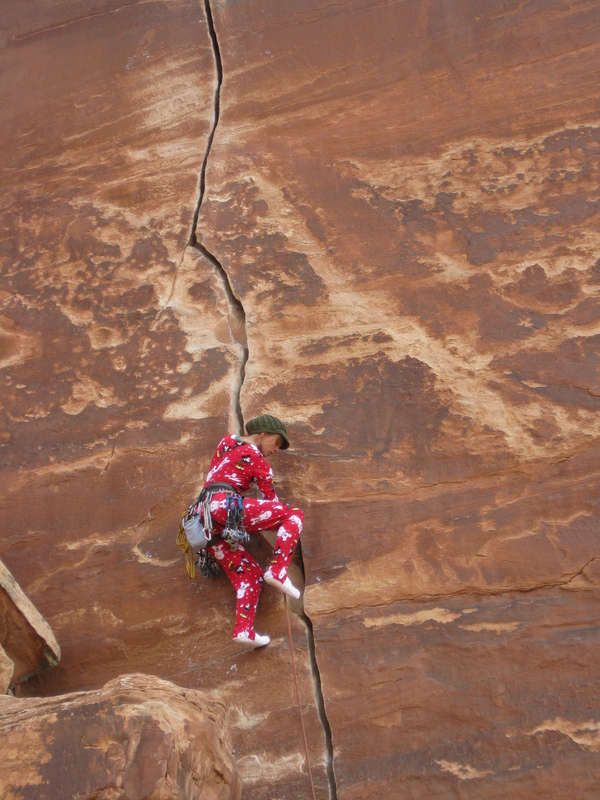 The crack had felt tight for me, so it must have felt even smaller for him. He tried pretty hard, but fell just before the rest pod. A little rest and he sent to the top – it’ll go next time! Then Sarah Kate got on the route. I’d rounded up a total of 5 black Metolius cams from our gear and our friends’ gear so she’d have better pro for the route. Even though she didn’t quite have the endurance to send the route, she stuck with it, climbed every move, and even took a big whipper on a green Camalot near the end – a very proud effort. Sarah Kate on Quarter of a Man (5.11++). The sun had gone down while Sarah Kate was on the route, so it was time to head back to camp for dinner and campfire sitting. 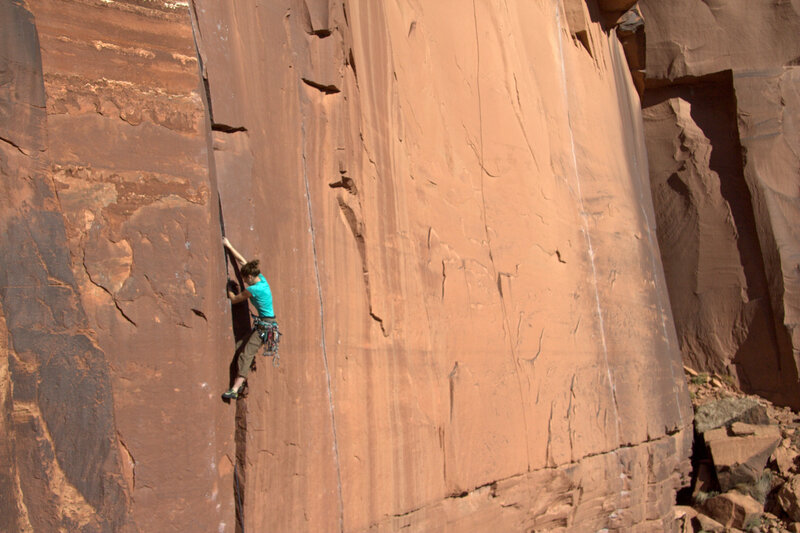 Scarface (5.11-), Wavy Gravy (5.10-), and Mantel Illness (5.11) were on various people’s to-do lists, so we headed to Scarface. Lindsey and I warmed up on Unknown 5.9 to the left of Wavy Gravy, while Luke, Konstantin, and Sarah Kate got on Wavy Gravy. Lindsey also sent Wavy Gravy after warming up. I was feeling pretty tired and not psyched about leading it (or TRing it, because I like leading anything that’s not a warm-up at the Creek – it’s good for me mentally), so I abstained. Andre, Leah, and Luke all sent Mantle Illness and Sarah Kate, Lindsey, and Konstantin headed over to get in line for Scarface. 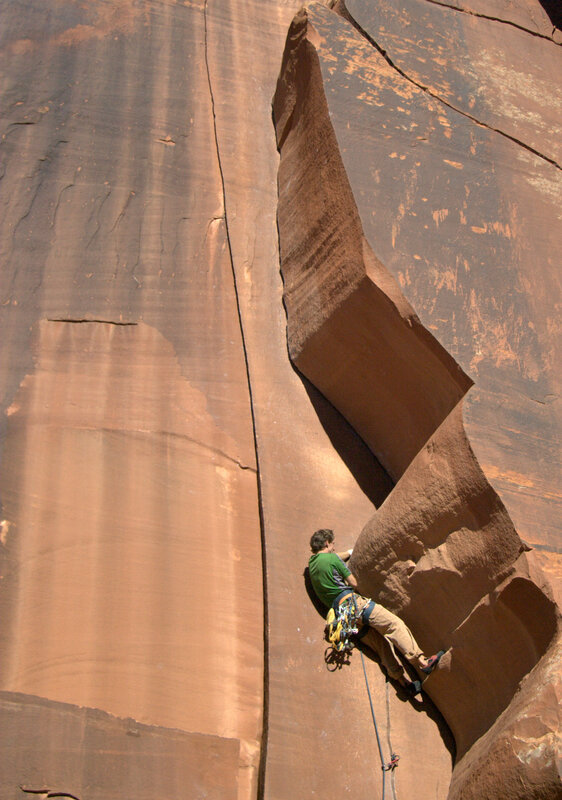 Luke sends Wavy Gravy (5.10-). 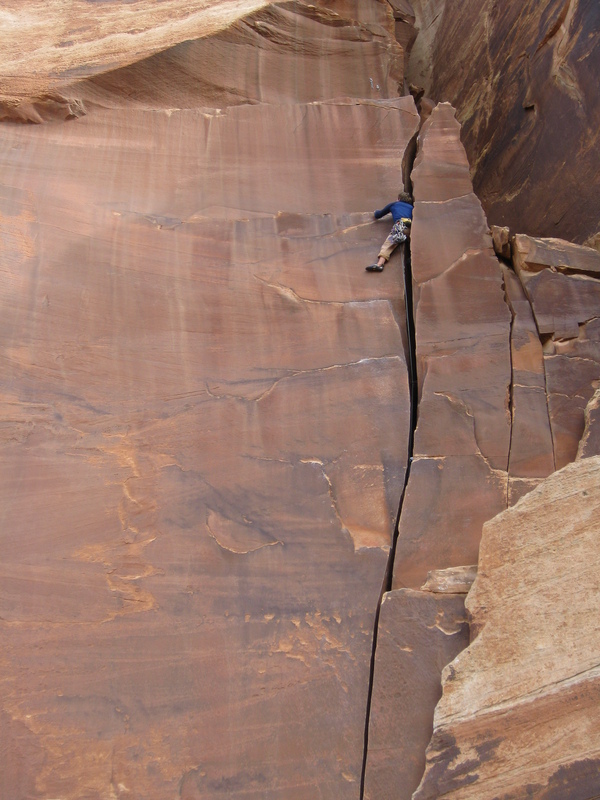 Meanwhile, I had scoped out a thin crack corner called Way of the Gun (5.12) and wanted to go for it. I made it through the initial corner (easier than I’d thought) and the roof, but took when I realized I didn’t have the right rack for the corner after the roof. I got more cams from the ground support crew, which was good because, although it was short, the upper corner was definitely the crux, with some very sport-y climbing (i.e. not straight-up jamming). Leah and Luke both toproped the route, having more success on the upper section (they are much stronger crimpers than me) than I did. Luke had belayed Andre on Twitch! (5.11), which he and Leah also TRed. We all headed over to Scarface to check on the other group’s progress. Sarah Kate had sent first try, Lindsey was in the process of sending after many falls at the beginning, and Konstantin sent soon after. Success! While Scarface was being sent, Luke onsighted the Sicilian (5.11), a short, fierce off-fingers crack. At this point, everyone was starting to feel ready for a rest day, so we called it a day and headed back to camp. It had been 3 days on for Sarah Kate and I and 4 days on for the San Diego crew, so it was time for a break. Luke got up early to go put an anchor on an unclimbed crack we had spotted on our last trip and the rest of us rolled out of our tents a little later and directly into Lindsey’s car. We had delicious breakfast at the Diner in Moab, then amazing showers at the Texaco, then some chai, internet, and sandwiches at the Love Muffin. The Love Muffin closed early (2pm – winter hours) and Sarah Kate and I still had more work to do (this whole 1st year grad student thing…) so we headed to the Moab Library. In case you haven’t been there, the Moab Library is awesome. It is an excellent place to do work (if the Love Muffin is closed). After a quick grocery store run, we headed to the Moab Brewery for some dinner and beers, then back to the Creek Pasture to sit around the fire a bit. It was an excellent rest day. The post-rest day plan was to return to Battle of the Bulge to get back on some projects with renewed energy and the built-up endurance of the first couple days of climbing. We warmed up on Railroad Tracks (5.10-) and Unnamed 5.10-, then went straight to projecting. I checked out Christmas Tree (5.12+) and was totally inspired, but not totally confident I had the guns for the steep upper layback corner (the first half looked not so bad). So I decided to devote my energy for the day to some more attainable goals. Lizzy chalks from a fingerstack on Swedin-Ringle (5.12-). Konstantin wanted to try Swedin-Ringle, but let me go first so he could check out my beta. First, Luke onsighted Three Strikes You’re Out (5.11) with my camera on his harness so he could take photos. Thanks Luke! I felt really smooth and relaxed, solid even on the stacks, but my foot slipped unexpectedly when I was adjusting a cam out of a foot pod. I got right back on and easily sent to the anchor. I was frustrated, but also felt like the route was very attainable on the next try. 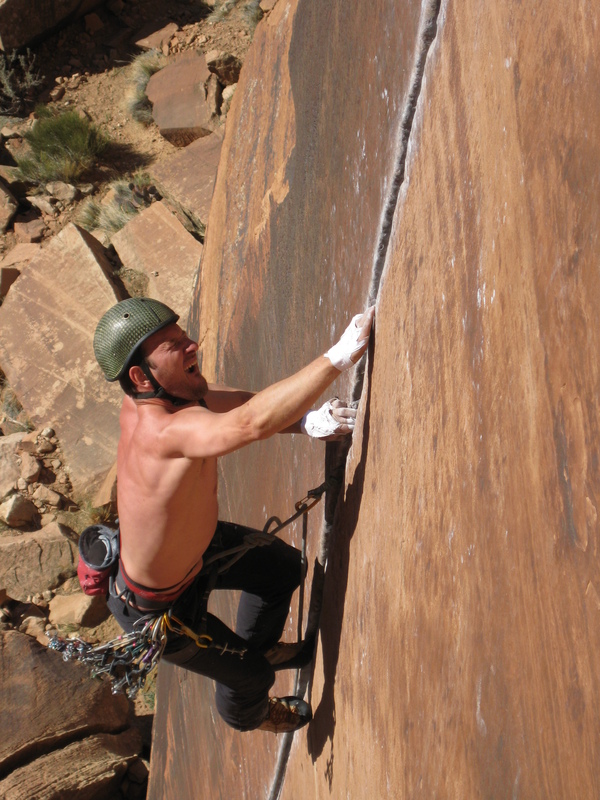 Konstantin got on the route and essentially learned to stack as he went. He was obviously trying pretty hard and took some sweet falls that involved me (the belayer) flying into the air. Konstantin trying hard on Swedin-Ringle (5.12-). When Konstantin lowered off, I got right back on the route and, with only a little bit of struggling at the grey alien section (my worst crack size), sent the route – my first 5.12! It felt great to send, on only my 8th time on the route (all attempts on lead, which I am very proud of) and for most of the route to feel so smooth and relaxed. I’d even say I might use it as an intermediate warm-up for other 5.12s in the area in the future (yes, it is that fun). Meanwhile, Lindsey had gone over to get back on her project, The Jane Fonda Total Body Workout . Although she made progress and climbed higher than her first attempt, exhaustion and pump took over and she had to take. I’m sure it was a valiant effort, because she was exhausted for the rest of the day. Afterwards, Sarah Kate (who had belayed) came back over to the Swedin-Ringle area and flashed Three Strikes You’re Out, her first solid 5.11 at the Creek. Sarah Kate flashes Three Strikes You’re Out (5.11). Luke and I then headed over to Digital Readout so he could have another redpoint go. He felt much more solid than on his previous tries and clipped the chains, for his first solid Indian Creek 5.12. I was FULL of psyche, so I convinced everyone else to let me go first (I guess they like to have my beta…). The initial crack felt WAY easier than when I had gotten on it on our first trip. I was able to get very thin hand jams from the very beginning (probably because I was much stronger on this trip) and quickly made it to the money section (which is most of the route) of red Camalots forever. IT WAS SO GOOD. I was a little sad when it ended. Sarah Kate flashed for her hardest trad lead ever! Yay! Luke also flashed, with a bit more struggling than the rest of us due to his larger hand size. Lindsey also got on, but ended up taking a couple times, being still tired from doing Jane Fonda in the morning. 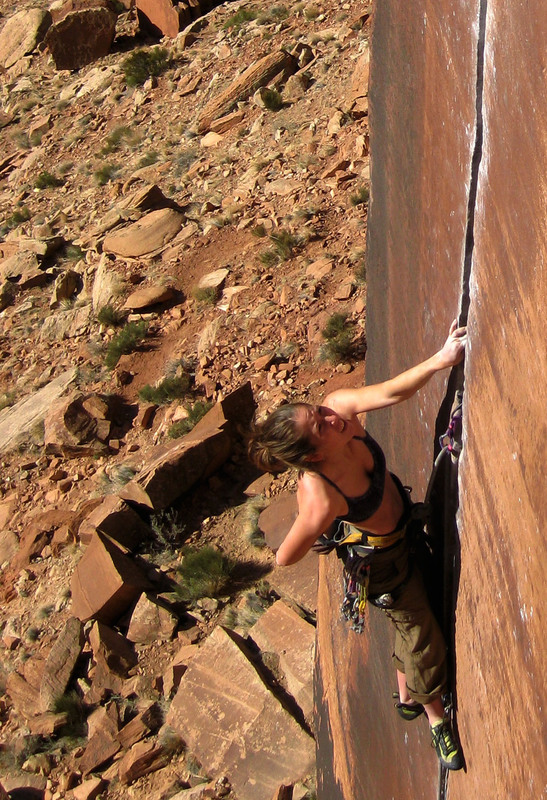 Sarah Kate flashes Coyne Crack (5.11+). It had been a great day of climbing and I would’ve kept going, but it was starting to get dark and we had Thanksgiving dinner to make. Together with food from Bob and Heather, we had a fantastic Thanksgiving meal, complete with mashed potatoes (real), stuffing, green bean casserole, sweet potatoes, cranberry sauce, and chicken cooked in the fire. Somehow everything was ready at the same time, but I guess that’s just the magic of Thanksgiving. We headed back to the Cat Wall. Luke and Konstantin wanted to try King Cat (5.11+) and Sarah Kate and I had been told that we should try Mad Dog (5.11+). After warming up on Unnamed 5.10 and Cat Man Do (5.10), we headed over towards Johnny Cat to get on the projects of the day. Konstantin on King Cat (5.11+). Luke and Konstantin both made valiant efforts on King Cat, but had trouble figuring out the beta for pulling the roof. I tried to onsight Mad Dog, but got pumped for essentially the first time all trip (while climbing, at least) and fell. After resting and unpumping, I sent the rest of the route cleanly, but my psyche and energy were pretty much gone for the day. Sarah Kate and Lindsey both got on the route afterwards and struggled with the tight green camalots, but eventually made it to the top also. A project for all of us for another trip to the Creek. Lizzy on her onsight attempt on Mad Dog (5.11+). Luke tried to onsight Cat Burglar (5.12) and fell just short of the anchor, but sent on his 2nd try for another Indian Creek 5.12! Luke ended the day with an onsight of Bachelor Party (5.11+). I discovered a potential pre-Christmas Tree project in this vicinity, too: Cathedral of the Mad Feline (5.12+), a steep Lisa Gnade tips corner. It was gorgeous and would definitely be good training for the steep section on Christmas Tree. Everyone was starting to feel pretty tired and we’d heard forecasts for rain and other bad weather coming in on Saturday afternoon, so we decided to pack up camp in the morning, go climbing, then start driving home whenever we got tired or it started raining. 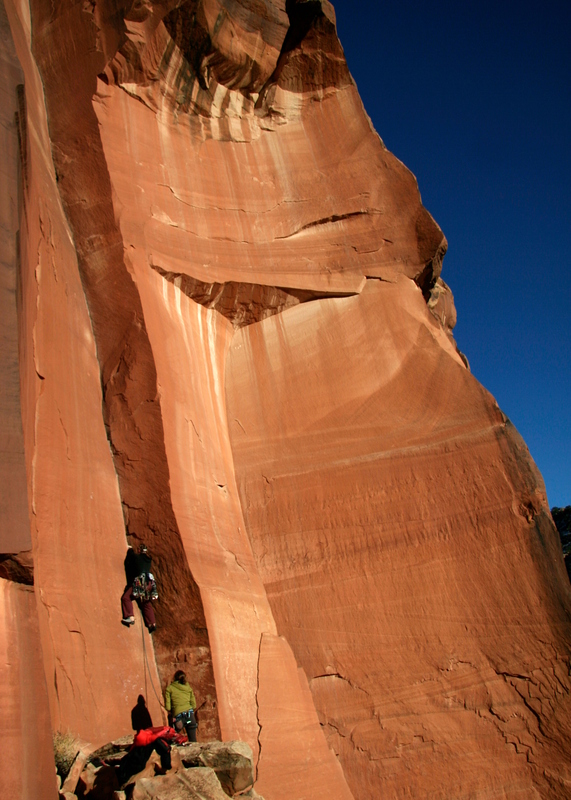 Bob wanted to go to Way Rambo to work on Slice and Dice (5.12), so we decided to go there, too. Luke and Konstantin were psyched on Way Rambo (5.12-) and I was considering trying to onsight Layaway Plan (5.11+). Luke getting sucked into Way Nutter (5.9 OW). We got on Blue Sun (5.10-) as a warm-up, while Luke and Sarah Kate also did Way Nutter (5.9 OW). Lindsey had brought a fleece Mickey Mouse Christmas themed onesy, so she wanted to do some climbing in it before we left. So she lead Blue Sun in the onesy, which was pretty awesome to watch. Lindsey climbs Blue Sun (5.10-) in the onesy. After warming up and checking out Layaway Plan, I decided to go for it even though I was deeply intimidated by the roof. Everything went pretty well until just before the roof, when my foot slipped off a sandy foothold – no onsight. Even though the pressure was off, I was still worried about pulling the lip of the roof, the crux. I placed my gear, transitioned into the undercling and, with much effort, pulled around the roof. The rope drag was awful on the last couple feet, but luckily there were good stances. An awesome route! Luke followed to clean my gear. Lizzy underclings out the roof on Layaway Plan (5.11+). Konstantin got on Way Rambo, but took several falls at the beginning of the stacks section, and lowered down off two cams so Luke could have a try. Despite feeling tired (on his 7th day of climbing at the Creek), Luke sent first try! 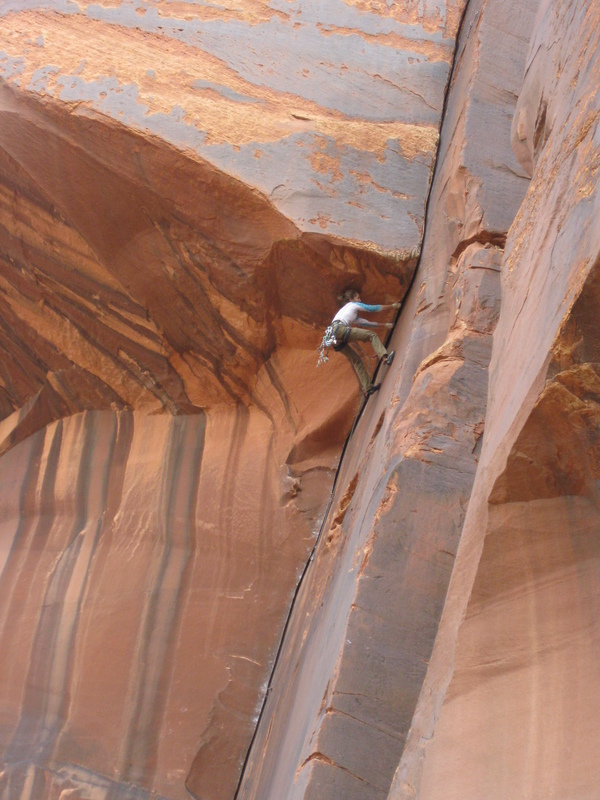 Luke sends Way Rambo (5.12-). Meanwhile, Sarah Kate and Lindsey had both taken TR laps on Slice and Dice and we watched a dude flash it with beautiful style – very inspiring. Everyone was pretty tired by this point, so we decided to call it a day (it was already 4pm anyways) and load into the cars to head home. Luke, Sarah Kate, and I drove into Moab to enjoy some dinner at Zax before driving north to Salt Lake City and finding a motel for the night, happy to have cut several hours off our driving time for Sunday. We had a pretty uneventful travel day driving from SLC to Palo Alto. There was barely any traffic, which was awesome (especially compared to the post-Thanksgiving Vegas-LA traffic). We took a little break in Reno to check out the Patagonia Outlet, which was pretty cool even though the prices weren’t quite low enough for me and most styles I actually liked weren’t in my size. Luke got lucky with a couple shirts and pairs of pants, though. This was by far the best trip Luke and I have had at the Creek. We came into the trip feeling strong, started slow, conserved skin, and tried really hard (at least I was super comfortable pushing and falling from above gear by the end of the trip, I don’t know about Luke, but he did take a couple falls, too). It was awesome to finally have some success (and some near success). Sending Coyne Crack and Swedin-Ringle and onsighting Quarter of a Man were really big accomplishments for me and I’m super happy. Coming so close to onsighting two other 5.11+ routes (1 fall each on Mad Dog and Layaway Plan) isn’t so bad, either. Too bad it’s not Squamish season, because I’d love to take my strength and confidence onto some of my projects there. For more photos, check out our Picasa Indian Creek gallery. I went to Hawaii with other graduating seniors and grad students during my official spring break. It was sweet to learn a bit about igneous rocks in the field – my classes tend to be heavy on theory and light on hands-on experience. Sadly, it rained almost the entire time we were there. I had been looking forward to some nice Hawaiian sun. The day after we came back, I went to JTree with Luke, Julie and Josh. I caught up on my suntanning that I’d missed out on in Hawaii while everyone climbed at Hemingway, then put my saved energy to good use on Gunsmoke in the afternoon. I made my furthest link yet and pumped out in the corner because I hadn’t gone over my complicated beta beforehand. Then I was just too tired and flash pumped to recover. Maybe next time. But it felt great! The “real” crux is way easier than my short person crux! Then, I visited Stanford. I had a great time, loved the group that I would be working with and the research I would be doing, and was excited about the Palo Alto weather, which I think I would like better than Pasadena. After stressing out for 5 days, I got the good news that I was accepted to the PhD program in the Geology Department! I’ve officially accepted the offer now, so Luke and I will be headed up to Palo Alto for the fall! We’re really excited! And last weekend, we went to Bishop. I had my best day of bouldering ever on Saturday, sending two V3s (my 2nd and 3rd ever) and flashing a V2. One of the V3s was steep and juggy, definitely not my style, so it was cool to have sent it anyways. The other one was a problem I’d tried and loved before – Sad Parrot. I’d figured out the crux beta before and this time I had the strength to pull the move. So I guess I’m somehow bouldering stronger than I ever have before, which bodes well for our upcoming Joe’s Valley trip. But I’m also hoping I can combine this newly found power with more endurance for the ultimate goal – Smith and Squamish in June/July. I’m also attempting to train for a 22k trail race in Malibu on May 9th. I decided this could be a good substitute birthday challenge (1k for each year plus one bonus) and I’m hoping just to actually finish, run a good amount of uphill sections, and feel better than I did on the Montana de Oro 8k. So now I’m busy finishing up my LAST TERM EVER at Caltech. Its crunch time now for writing my thesis, so I’m spending a lot of time working on my research (and loving it, which seems like a good sign for grad school). Lizzy an I are back in SoCal after a wonderful week in the Utah Desert. We really had a fun time at Indian Creek and hanging out in Moab. I’ll get into more details nd write a proper Trip Report once we get some photos downloaded later this week. We got back yesterday after an uneventful drive from St. George, where we had stayed the night after driving 6 hours from Moab. Sunday morning we hiked up to the Mentor cave at VRG to scope out the climbing for a future trip. It wasn’t too cold to climb in the shade but it was a bit windy and a poofy might be advisable for belaying. The limestone looked super featured and the climbing seemed STEEP! I would be psyched to do some bolt clipping in the future. We should have a bunch of posts up later this month as we recover and get back in the writing mode. I will be finishing up a TR of my brief Red Rocks trip and Lizzy has gotten a chance to play with many of her climbing toys and should be posting some of the gear reviews she mentioned before. To give my fingers a bit more time to recover I will be running a trail race this weekend. I opted for a shorter race, 15k versus my last one of 25k, so that I can work on my speed. It’s local to San Diego which should be fun so I may be running with some of my co-workers. Hopefully I can run part of the course later this week for training. It is nice to return to the same climbing bubble despite checking out from reality for a week. Sharma is in good shape and on the verge of sending another 5.15 and Kevin Jorgeson has done another highball FA. I look forward to reading various trip reports and updates as I catch up on the 400+ blog posts that I missed while we were away. PS It’s Lizzy’s Birthday Today! WAHOOOO! My first “class” (only kind of a class since it’s an interesting seminar with free dinner) is tomorrow and will signal the end of my winter break. I’m definitely excited to jump into the new year – the last 2 terms at Caltech, hopefully a grad school acceptance letter, and lots of new adventures. I’d been thinking about writing a “goals for 2009” post, but I’ve decided against it because, as I’ve already been shown, life is full of unexpected turns and challenges and I don’t want to be frustrated by having a fixed agenda. Suffice it to say that I’d like to climb a bit more, run a bit more, go on more cooking adventures, and be less stressed. Those sound general enough, right? My break has been pretty fantastic – restful, lots of visiting, a bit of climbing, and a bit of snowboarding. Marred only by being sick for almost the entire month of December. In fact, I managed to strain one of my intercostal muscles on Jan. 3rd from coughing too hard. Surpisingly to me, this muscle is involved in a lot of things – breathing, coughing, sneezing, laughing, laying on my side, using my abs, picking things up, etc… Although ibuprofen and rest seem to be helping a bit, my 2009 training will have to wait a few days. But I’m addressing one of my other goals by not worrying about it. Luke sent some projects at Bishop (I’ll let him blog about that) and we managed to do a bunch of snowboarding without getting too bruised in the process. On our last day we checked out the Druid Stones, which we definitely want to return to next time (this was the first day of my intercostal strain, so hiking up the hill with my crashpad and then bouldering seemed out of the equation for me). We now have about 8 inches at our house, which is less than 100ft above sea level. And it’s still snowing. To distract myself from worrying about my flight tomorrow, Maddy and I went sledding. It was sweet. Maddy also built a snow daschund, which is also pretty sweet. You know you’re missing out. Watch funny videos on the internet! These are two of my absolute favorites and I hadn’t watched them in a while, but they’re just as good as they were the first time I saw them. After weeks and weeks of sunny weather and 80-90 degree temps, we were beginning to wonder if “winter” just wasn’t going to happen in SoCal this year. But now, apparently, it has arrived. As I’m sitting here in Luke’s (cold!) house in San Diego, it’s raining and windy outside in a way that makes me feel like I’m in Seattle, not San Diego. Out in the desert on Saturday, it was so windy that I was worrying that pages would get ripped out of my notebook and I almost got knocked off the outcrop several times. Check out this crazy weather. Also, there’s an 80% chance of snow in the greater Seattle area on Wednesday. I am still young enough to think that this is Really Awesome as opposed to Unfortunate or Annoying. Because it doesn’t snow a whole lot in the Seattle area. And we rarely get such good probability of snowfall. The only unfortunate part about this Awesome Weather is that I’m supposed to fly to Seattle on Wednesday. The day with the snow. Oops. Hopefully I can actually get there to enjoy the snow. Anyways, Luke and I will be out in Virginia for Christmas and then exploring the climbing around St. George for New Year’s, which we’re pretty excited about. Hopefully everyone has a relaxing, safe, enjoyable (and snowy?!?!) holiday! I have less than 6 months til I graduate!